Westminster Calls an Election ... whilst the Scottish Diaspora Tapestry looks on! 21-Apr-2017 No surprises then at Westminster ... all in a day's exhibiting by Crown Court Church! As we opened there the tragic murders on Westminster Bridge and immediately outside the Hall on New Palace Yard closed us for three days; and consequently meant the cancellation of the 'Diaspora High Commissioners and Ambassadors' Reception. And now this week The Commons has voted itself out of a job so the planned 'Reception for MPs' after they returned from their Easter Recess yesterday has been still born. All eyes now perforce turn to St Giles Cathedral on Edinburgh's Royal Mile where the next Official Reception is planned for Friday May 5th ... featuring groups of school children from across Scotland who have stitched their own diaspora panels. The St Giles exhibition runs from May 4th/ 18th. 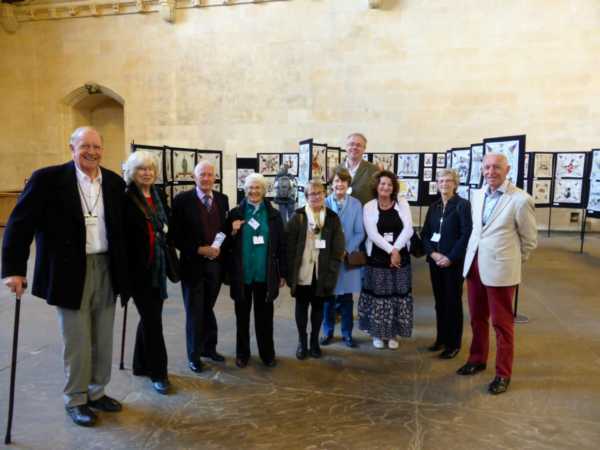 ... it is fitting to give especial thanks to the Westminster Hall curators and hosts led by Sheila Haddon and her Crown Court Church colleagues and support from NTS London members and embroiderers at large. No matter how events have conspired to change their schedules, plans and schemes, they have been ever present to assist scores of visitors and small groups alike. On Tuesday 18th April [with 10 days still to run at the Hall] Team Leader Gordon Prestoungrange was there again, this time with his family, and able to give such thanks directly as pictured [left] below - camera phone by 'Prestonpans Friend of the Tapestries' Margaret Ferguson Burns who was assisting with visitors who has also spotted inappropriate moths amongst them! 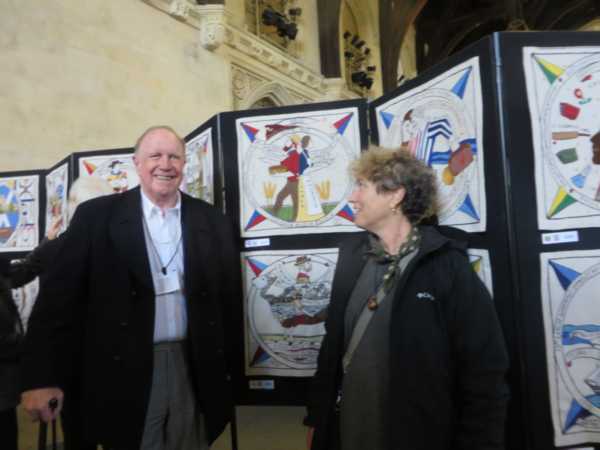 He was also delighted at a chance meeting with Argentinian stitchers of AR01, Nueva Escoia, Campbells Lorna and Jean both en route to their own family reunion in Scotland - posed below in front of that panel. Argentina has especial interest for Gordon since his own maternal Musselburgh ancestors Mungo and Grace Park are depicted in AR03 stitched by Aberlady cousin Sheila Baird direct descendant of Willie Park Senior and Junior.